“The decision by Governor Cuomo to veto two commonsense adjustments to the property tax cap is disappointing. "Both bills passed each of the legislature without a single negative vote. Neither would have made fundamental changes to the tax cap. Instead, they would have assured similar treatment of similar financial items. One would have treated capital expenditures for BOCES (Boards of Cooperative Educational Services) the same as capital expenditures for school districts. The other would have given tax base growth generating payments in lieu of taxes (PILOTs) the same consideration as growth generating property tax revenue. “BOCES are the primary vehicle by which school districts share services, including administrative overhead functions. BOCES capital projects must be approved by voters in each one of the BOCES’ component districts. But requiring each district to absorb BOCES capital costs entirely within their existing tax cap limit makes gaining this unanimous district support impossible in some cases. 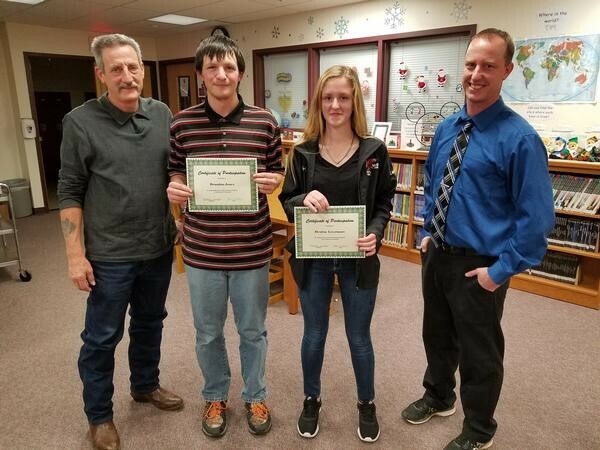 Students Brandon Jones and Desirae Livermore recently spoke about to the McGraw School Board about their experience working in the Facilities Department in the district this past summer. They talked about their interview experience, the tasks they completed over the summer, the people they worked with, and the post-interview with their supervisor, Facilities Director Tom McCall. McCall shared that he wants to help the students grow by expanding the application process to include resumes and references, discussing attendance and expectations, giving them training, and conducting post-interviews to address their future goals. He commended the students, expressing his pride in the students for work well-done. He added that he now feels that the student body is more respectful of the facilities, especially the boys’ locker room, since it was repainted. The students echoed his sentiments, saying they were proud to be able to point out the work they had done. The Central Western Chapter recently recognized two retiring members of their chapter. 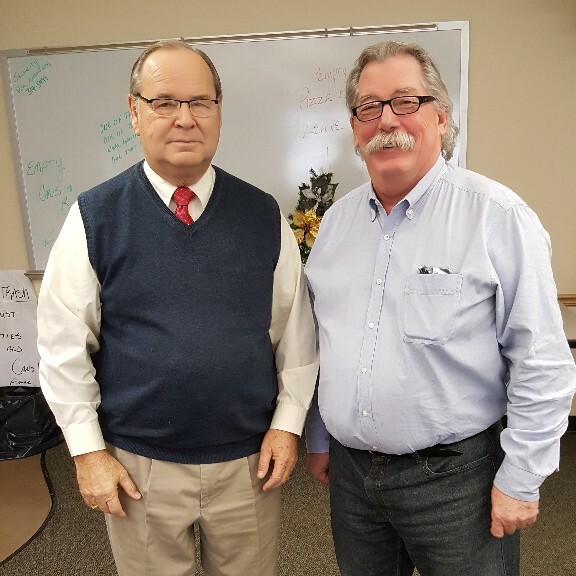 DOF David Hathaway of Greece Central School District and Jim Day of Day Automation were recognized for their contributions to the chapter at their December meeting sponsored by Day Automation. David was presented a gift on behalf of the chapter thanking him for his involvement and support over the years. 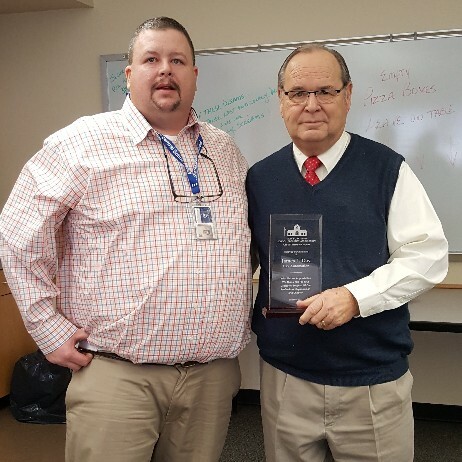 Jim was presented a plaque from the chapter thanking him for his “Dedication to Our Profession, Organization and Chapter”. The bus garages are not in great shape at either Elizabethtown Lewis Central School or Westport Central School. And all told, each school needs more than $1 million in repairs and renovations, according to 2015 studies. If the districts were to merge, their combined aid ratio would jump to more than 90 percent, officials said at a recent meeting of the Merger Study Advisory Committee. Separately, they said, the districts have aid ratios of 64 to 65 percent. Transportation was the focus of the latest session. Discussion revolved around the length of bus runs and bus-driver staffing. The New Paltz Central School District is revisiting the possibility of changing school day start times. The renewed interest in the changes comes in the wake of Ulster BOCES telling the district that it still would be able to accommodate New Paltz students who are enrolled in BOCES vocational programs. A new “store” has opened in Utica just in time to give a holiday gift to area teachers from qualified schools. Teachers can pick up paper, paper clips, paper towels, pens, letter trays, books and other school supplies by the bagful. There’s just one catch: It’s all free. Budget cuts have made it hard for schools to supply teachers with everything they might need, said Rachel Daughtry, director of agency relations for Compassion Coalition, which set up the store in a corner of its warehouse. Most teachers end up paying for things themselves, she said. Rakim Scales thought about being a teacher when he taught a fellow student how to draw. Lavonna Gaines was inspired by two teachers who gave her the help she needed. And Gabrielle Baldwin credits her 4-year-old sister for steering her toward a future career in teaching. The three are among the inaugural class at the new Urban Teacher Academy at McKinley High School, and while still young – they're all freshmen – they offer hope for diversifying the future teaching ranks in the Buffalo Public Schools. The Urban Teacher Academy, launched in September with 18 freshmen, is a joint initiative of the school district, the Buffalo Teachers Federation and SUNY Buffalo State to address the lack of teacher diversity by using incentives to recruit high school students to the profession.